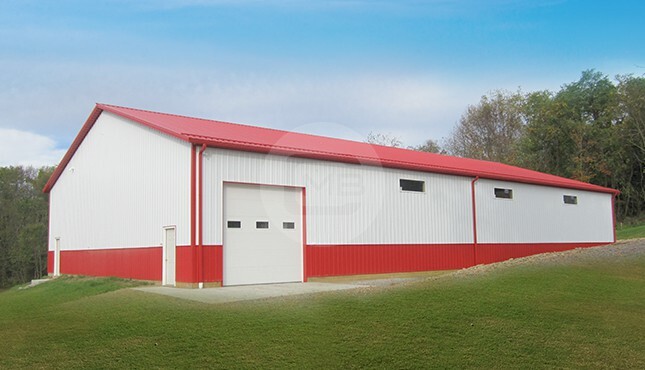 As opposed to the more common widths of 40 or 50 feet, a 60’-wide metal building from Metal Barn Central gives you extra space to meet more of your storage needs. You can also customize the building height to your specifications, giving you the ability to accommodate taller vehicles or equipment like an RV or a combine harvester. With clear span framing, this building provides 3000 feet of open, column-free space that can be customized and divided any way you choose. 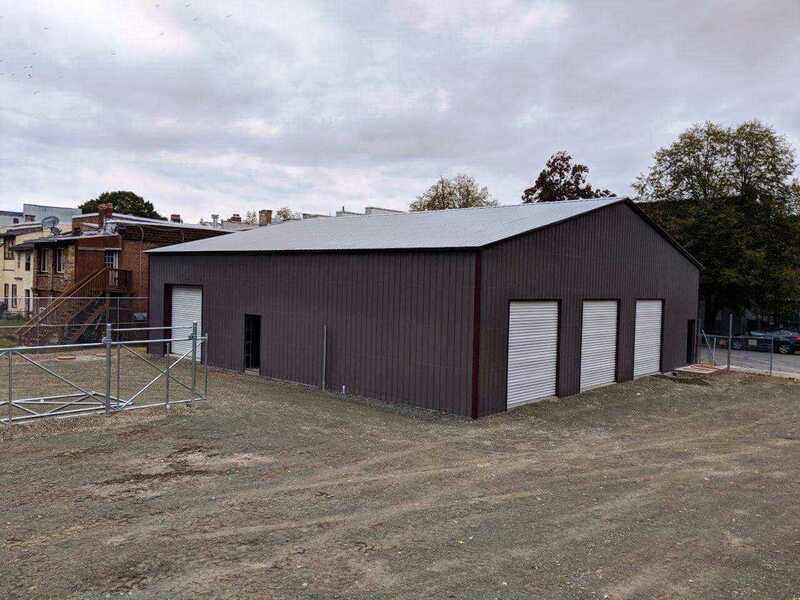 You could even choose to designate a portion of the 60’x50’ metal building to be used as insulated, climate-controlled living space (complete with walk-in doors and windows), and then set aside the rest of the building for open storage space. A building of this size may be larger than you need at home, but it’s ideal for many farm and commercial applications. Farmers and ranchers like the room a 60’x50’ metal barn supplies for keeping hay, equipment, or livestock. Churches or schools could divide the structure into classrooms or offices or choose to just leave the space open for a large gathering area or recreational area. A metal building this size also works great as a storefront, restaurant, or auto repair shop. 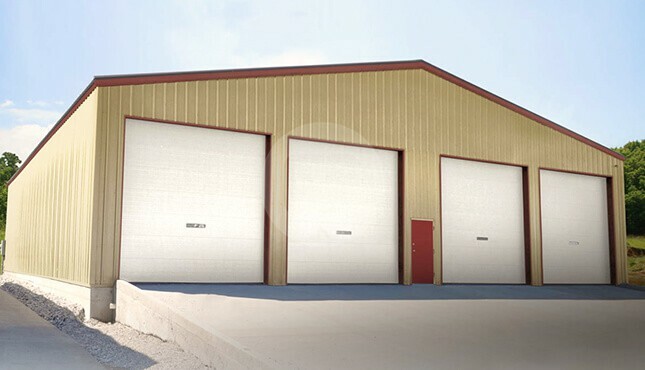 Your 60’-wide metal building can be equipped with garage doors, walk-in doors, windows, gables, and other customization options for full functionality and convenience. Why Choose an Engineered Metal Building over a Stick Build? Many businesses and homeowners prefer metal buildings over wood for the simple reason that they last up to 4 times longer (or more)! Why else should you choose a steel building from Metal Barn Central over a wood-frame building from someplace else? Each component is engineered to a specific size, weight, and strength. Steel components go in straight and true, and they stay that way – no warping or bowing to worry about. Doors and windows stay in place, never sag, and always open and close properly – unlike wood that gets swollen or weak from moisture. Steel framing is much more durable and versatile than wood. Our structures are designed to withstand high winds and heavy snow loads and will last for a lifetime. In fact, a steel building is something you can pass down to your kids for future generations to enjoy! Steel is not vulnerable to many of the concerns that wood carries. Our steel framing offers greater protection from termites, mold, mildew, heavy winds and precipitation, even lightning and fire. Steel buildings are also basically maintenance-free in comparison to wood structures, so they’re much more cost-effective over time. Oh, and steel buildings are much easier to remodel and expand than wooden buildings, too. Are you someone who cares about doing your part to conserve Earth’s resources and reduce your ecological footprint? You can’t choose a better construction material than steel. Steel is one of the most recycled building materials in the United States, and it continues to be in high demand. When you go with a steel building, you’re making an investment in something that is almost 100% recyclable, should you ever decide to re-purpose your space in the future. If you’ve got a particular metal building in mind, go ahead and give us call today at (980) 321-9898, one of our friendly and knowledgeable building specialists will be happy to help you get started! OR, you can navigate to our awesome 3D building tool and start designing your custom building yourself at 3D Metal Building Estimator!